Spending a lunchtime (or even better, a lifetime) as a dawdling flaneur in a new city is never an experience wasted. Earlier this week it was Bristol. And here's an important boat. 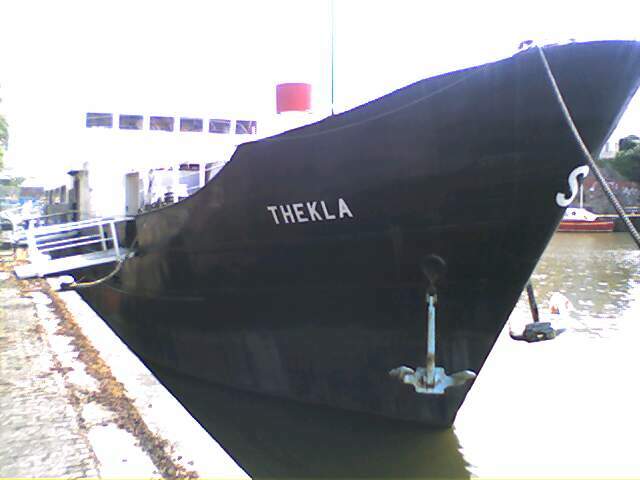 Now a nightclub, once owned by Vivian Stanshall of the Bonzo Dog Doo Dah Band, this is the Thekla. The venue for Viv's musical Stinkfoot, it seems to be such a permanent part of Bristol that it's even mentioned on the street direction signs.